Probably the two biggest selling Canadian whiskies, representing two contrasting interpretations of the corn-rye blended mash bill style of Canadian whisky cry out to be compared head to head. 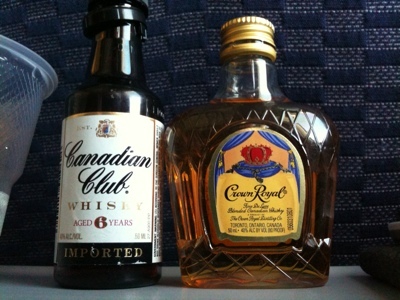 Here I am stuck on an airliner over the Atlantic for 8 hours with an airline bottle of each. It's time. "The Canadian approach to making whisky is to develop the different flavor elements separately and then bring them together to create the final product that is new and unique, while at the same time evincing the brand's house style. A new Gibson's whisky will always be creamy and voluptuous; Crown Royal will always have elements of bourbon and vanilla; Canadian Club will always be known for its fruitiness..."
How will these two low cost base expressions evince these big brand's house styles? $13-$15/750ml in NYC area for a NAS labelled version. This 6 year age statement labeled miniature came off an airline beverage cart. Nose: Soft vanilla fudge, medicinal alcohol, distant cedars. Palate: soft sweet creme caramel, and fruity notes of prune and apricot, yielding shortly to a surprising amount of spirit heat for a 40% abv. spirit. Medicinal rubbing alcohol flavors make an unwelcome intrusion at the mid-palate. Grapefruit citrus and evergreen scented oak show at the turn to the finish. The finish itself is rather nice - soft and malty with gentle cherry malt and wheat flavors - and of a surprising duration given how light the flavor signature is up front. However the rubbing alcohol flavors of grain neutral spirits that appear in the nose and mid-palate spoil the show for me. Drinkable, particularly mixed, but not worthy of recommendation for sipping neat. Crown Royal 40% "Fine De Luxe Canadian Whisky"
turn to the finish has the soft cherry malt and vanillin notes creamy, sweet, meet a muted grapefruit bitterness and a hint of tannic bite. The finish is gentle, malty cherry vanilla sweet with lingering grapefruit bitter notes and is medium short. Not an epicurean experience, but distinctly sippable for a blend and full of characteristic Canadian whisky flavors of the corn base whisky school. My main complaint is the waft of grain neutral spirit rubbing alcohol in the mid-palate - but it's not a fatal flaw for me. Unusually, for me, Crown Royal is much more vibrant and fully flavored freshly poured, without the period of airing time that I usually find mandatory when dramming. I don't need to paint this out, right? Canadian Club 6 is the bottom rung on on a substantial ladder of CC products which include some seriously premium selections. It hits a very low price point put promises to have some of the flavor profile which has established this line for over a century. However it is unbalanced by too much raw alcohol flavor. It is clearly intended as a mixer and that's all its good for. 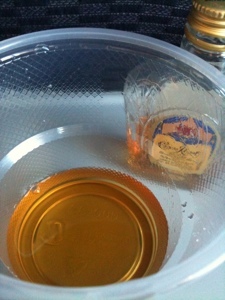 Crown Royal, another classic and bottom rung on a big series is clearly meant as a sipper. It's almost twice the price, but the premium appears justified. I enjoyed sipping it neat and will certainly do so again. Update: I realize I should compare Canadian Club Classic 12 with Crown Royal for price parity. That would be a fairer fight. I'll have to revisit this in a future post. 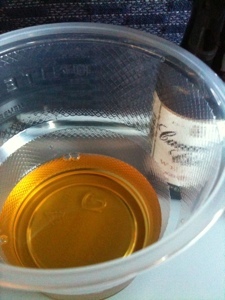 (Note: airline plastic cups are pictured depicting color for fun - as part of the airline theme of this post. Such cups are useless for drinking whisky, however. All aromas are lost and the flavors are seriously muted. I know, I tried. I carry a mini-glencairn "perfect dram" glass for such situations). WhiskyLassie, thanks so much for stopping by. The post which gets the most hits of all on this blog is the Johnnie Walker Black Label versus Chivas Regal 12 head to head matchup which I did on an airplane in much the same fashion. I'll contact you privately about widening my Canadian horizons. I bought a bottle of CC 6 yr at a duty free a couple of years back, but I've never seen it in Canada. Maybe it's available and I'm just not looking very hard - because it's not something I would normally purchase. The 12 year is very popular up here however. you know that no Grain Neutral spirit is used in canadian whisky, right? I'm aware now (because of Davin De Kergommeaux's book "Canadian Whisky" that "Canadian law requires that all of the spirits in a Canadian whisky be aged for at least three years". I wasn't , however, aware of that at the time I wrote that review. Thanks for pointing this out. Nonetheless, I tasted what I tasted. But I certainly grant that I wasn't actually tasting any grain neutral spirits. Grain neutral spirits, to be precise are defined as "spirit distilled from grain, distilled to over 190 proof and bottled at over 80 proof." In the USA, a blended whiskey can contain up to 80% grain neutral spirits. Canadian whisky, however, must be aged at least 3 years in wood - every drop. That's the origin of Canadanian whisky's reputation for quality. While Canadian law doesn't specify the maximum alcohol concentration Canadian whisky can be distilled to - so theoretically a Canadian distiller could make a spirit which would legally be a grain neutral spirit - after 3 years in oak it would no longer be so. Besides, no Canadian distiller does so - according to Davin De Kergommeaux in his book "Canadian Whisky". So, in practice, there isn't any grain neutral spirit in Canadian whisky. Not a drop.